Home / News / Flexible Office Anyone? Looks like flexible workspace is here to stay. With the rise of the millennial workforce, which will make up an estimated 50 percent of the global workforce by 2020, and growth within the technology sector, more tenants are seeking flexible, non-traditional solutions to meet the demands of their rapid growth. Conventional lease terms of 3 to 5 years, do not fit in line with the pace of their growth. Additionally, we are now seeing established MNCs seek flexible solutions and shorter lease terms to address the challenges they face within the current economic climate. There is also the potential for significant impact on demand due to changes in lease accountancy standards, with Colliers expecting these changes to increase demand given that non-designated office space can now remain off of company balance sheets. As the flexible workspace market grows, traditional serviced office operators are reviewing their strategies to ensure continued growth. Regus have recently acquired a coworking operator which they are rolling out globally, while some other providers are reported to be scaling back their expansion plans in Asia Pacific. By contrast, New York-based WeWork, which just broke into the APAC region with its first Asian venue having opened in Shanghai this month, are on a huge expansion across Asia and Singaporean operator JustGroup are looking to export their JustCo model across Asia and beyond. What is the Impact of Growth in Flexible Workspace on Landlords? The growing popularity of flexible workspace has both positive and negative impacts for commercial landlords. WeWork has already become the biggest tenant in New York, and flexible workspace operators can be expected to take up large amounts of space in this region as well. In addition, most flexible workspace operators do not need to align lease commencements to the expiry of leases on existing premises, which creates pre-let opportunities. Finally, flexible workspace operators often act as generators of traditional tenants for the landlord if the client or member of the operator moves on to permanent space. One of the downside cited about flexible workspace operators is their potential impact of on the tenant mix within a building. However, this bottleneck can be turned into something positive for a project, provided that the builder operator chooses the flexible workspace provider that best compliments their existing range of occupiers. In Hong Kong for example, there are now a range of flexible workspace concepts to select from. A company can now choose from an operator such as Servcorp, who are considered the global market leader in premium flexible office accommodation, with traditional serviced office accommodation in Hong Kong’s most iconic development – Two IFC, to a local coworking operator, such as Campfire, offering space in a Grade B building in Kennedy Town. In between these two extremes lay a range of international operators – WeWork which will soon open 90,000 sq ft of coworking and serviced office space in Tower 535 Causeway Bay, and Regus who offer a range of solutions across the market. Start-ups often prefer the newer coworking arrangements, finding that while these spaces often cost more per square foot in rent than conventional office space, the reduction in capital expenditure and the flexibility offered (usually on month to month “memberships” rather than leases) is enough to off-set the higher rates. Co-working “members” are also often offered both face-to-face and web-based networking opportunities facilitated by the operators, with some providers even offering online platforms to exchange services as well as access to VCs and experienced mentors. 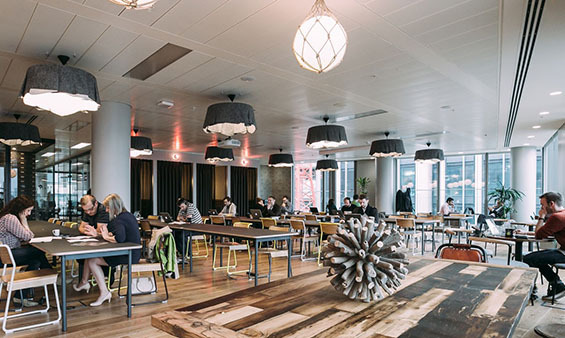 MNCs are also increasingly attracted to coworking operators, with WeWork, which has already branched out beyond coworking, hosting the UK’s Guardian Newspaper in one of their New York centres. The office leasing startup also hosts American Express, among other large corporates. Large financial institutions typically choose traditional serviced offices for branch or project offices. Servcorp estimate 60 percent of their clients are MNCs – with UBS working from a Servcorp’s centre in Doha and, Abu Dhabi Investment Authority, occupying Servcorp space in Two IFC. Globally, the demand for flexible workspace will continue to rise. Aside from the obvious benefits of limited capital expenditure and flexibility, the new lease accountancy standards mean that office accommodation that is non designated limits the initial impact on a company’s balance sheet. This article is originally from a sponsored post by Colliers International. Written by Jonathan Wright, Associate Director Office Services team at Colliers Hong Kong. Interested to create your own flexible office? Wurkspace 7 can help you create one at your headquarters! Contact us today.